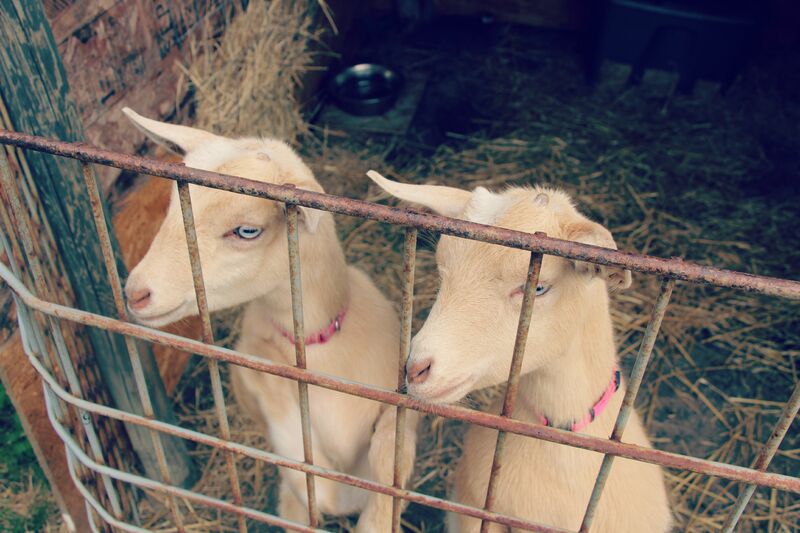 Stay at Homesteader Mom – Babies, chickens, and goats! Oh my! My husband and I finally made the announcement that we will be moving back to Texas. For those of you who don’t know, we were both born and raised in Texas and both of our families still live there. We have been living out of state for about 4 years now and we are more than ready to be closer to home! 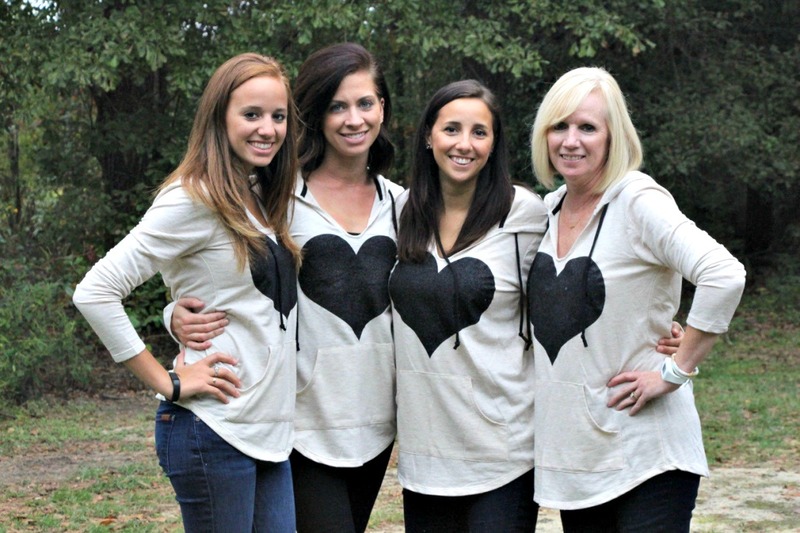 Although exciting, moving a family can become stressful and a little complicated at times, but we have grown pretty accustomed to it. This go around not only have we added a child to the equation, but more animals as well! With these wonderful additions comes a slightly more complicated process. Here’s how I got things started. The first factor for this move that we had to consider was transporting our animals from point A to point B. When the goats were little it wasn’t a problem putting them in the back of the 4-Runner with a little bit of hay and some blankets. Unfortunately, this will not work when driving over 1000 miles (at least not for us). My husband and I knew we would be moving some time in the near future, so in the months prior we would frequently search Craigslist for a good deal on a small livestock trailer. We were able to find a decent sized trailer in a city about an hour an a half away from us, so we jumped on that deal quickly! Even if you aren’t planning on moving you should make sure you have access to a trailer or vehicle large enough to accommodate your animals in case of an emergency. Another reason for you to get connected with other neighboring farmers! Our next step was deciding what animals would be coming with us. Due to the fact that we are moving out of state we had to consider the laws and ordinances for the incoming state. Different states require different tests, documentation, and procedures. We quickly came to the decision that we would sell our chickens here and start anew after the move. Many states will not allow chickens to cross state lines and some require that you get a bill of health for you chickens. We were not willing to consider those costs and decided it would be easiest to start over when we got there. 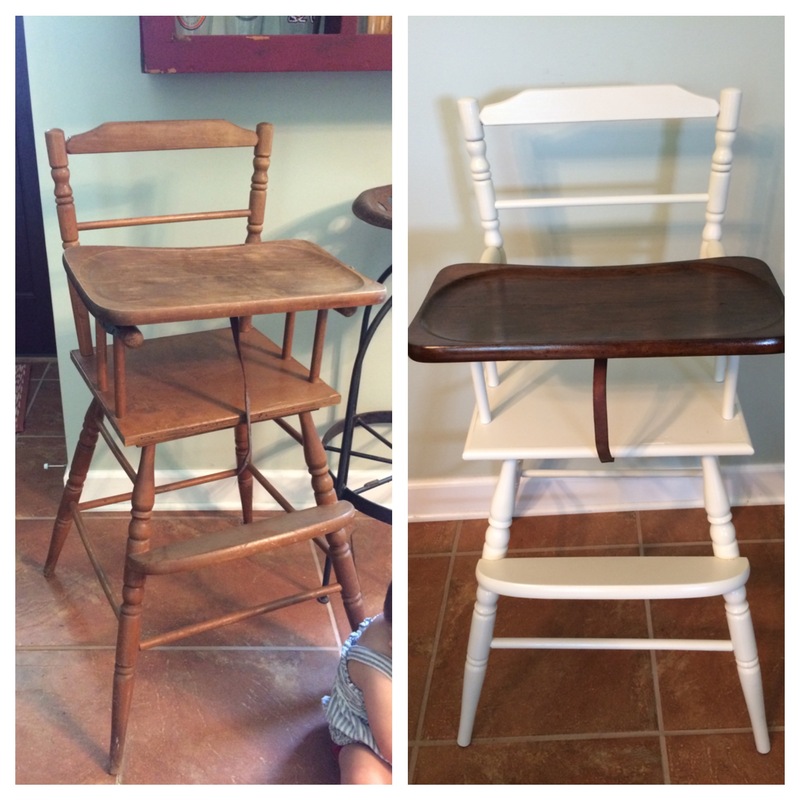 Fortunately, it was a pretty painless and easy process to sell them on craigslist. We had a buyer come by and get them all on the day I posted my ad! Next in line were the goats. It was no questions that we would keep them, but this was going to require some more research and a few phone calls. I first reached out to the Texas Department of Agriculture and had them brief me on their requirements. They informed me that if the goats were not registered they would need SCRAPIE (a disease that affects goats and sheep) tags, a Bill of Health from a vet, and a Premise ID number. Most of these things sounded foreign to me and I had no idea how to go about obtaining them, but luckily the man I was talking to was nice enough to walk me through the process. The next person I called was the South Carolina Department of Agriculture. They were able to direct me to a Veterinarian as well as quickly set up a premise ID. So great! Two things down! Of course the last piece was the most difficult part of process. This is not anyone’s fault but my own. I was informed that as long as my goats were registered and tattooed, I would only need their registration paperwork instead of SCRAPIE tags. The problem was, I forgot to complete their registration process. Without going into too much detail, it took me over a month to complete that process. So my advice to you, is if you purchase registered goats or any other animal, make sure you complete the process right away! The last thing to be considered was the set up of the new homestead. Fortunately the house we purchased already has a structure perfect for the goats as well as fenced in pastures. This makes things A LOT easier. We can literally open the trailer door and welcome them to their new home! We have already started planning out how we will setup and rotate chickens around the separate pastures but they will need a new structure (future blog post?). The next several months will be spent planning out exactly how we setup our new homestead and what new challenges we want to take on (besides baby #2). All in all, moving can be a lot for anyone to take on and adding animals to the equation definitely doesn’t make it much easier. If you prepare yourself ahead of time and familiarize yourself with the process, it can make things go a lot smoother. I will be sure to keep you posted with updates on the new homestead. Thanks again for reading! Wish us luck with the move! 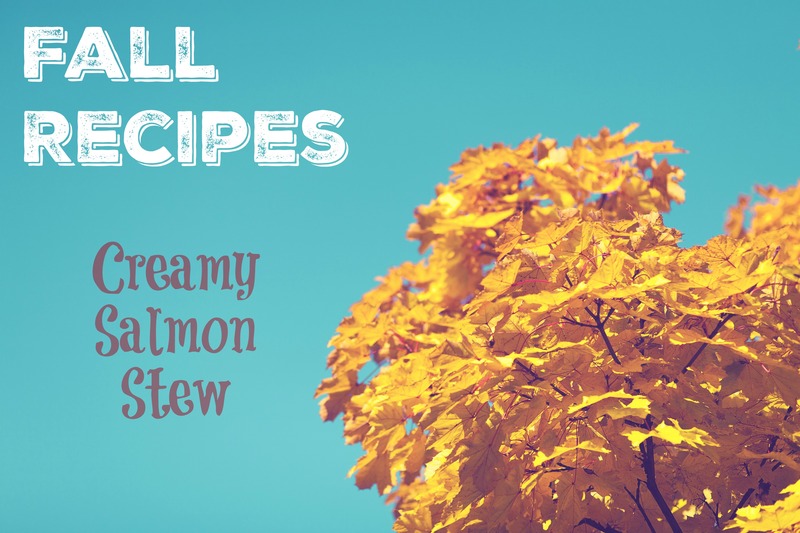 I thought to kick off this beautiful fall season it might be fun to share a yummy, warm fall recipe! One of my favorite things about cool weather is being able to enjoy all kinds of soups, chilis, and stews. As soon as the weather hits 75 degrees, I’m dusting off my crockpot and searching for new recipes on Pinterest and Google. I rarely ever follow one recipe exactly. Typically I will combine about 3 recipes into one, making it truly my own. There’s no shame in getting a little inspiration! If you aren’t a big fan of salmon you can change it up and add shrimp, lobster, or crab. Make it your own! You can pair this delicious stew with some bacon sandwiches and cozy up next your honey and enjoy the crisp fall air! 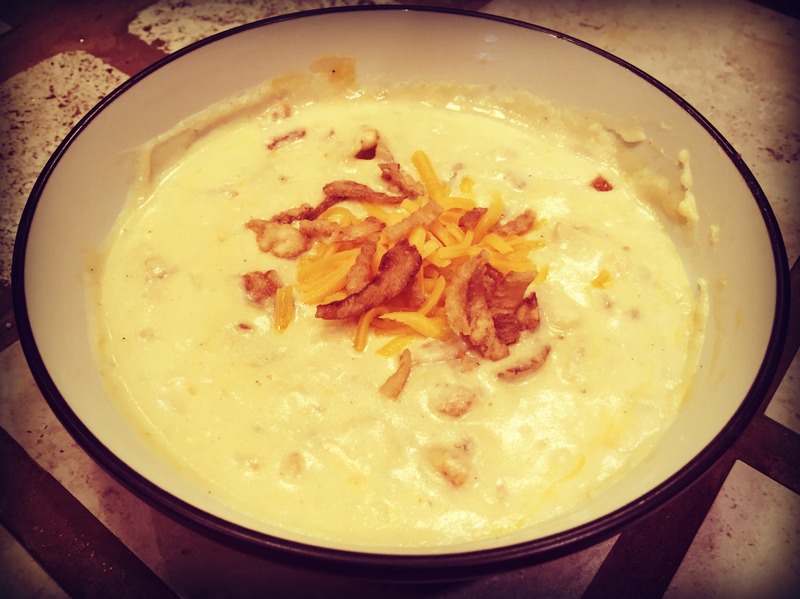 I hope you enjoy my recipe or maybe your own creation inspired by this one. See you again soon! Howdy friends! Now that the confetti has settled, we are finally getting back into the swing of things. The party was an absolute success. For those of you who don’t know, we just celebrated our daughter’s first birthday. 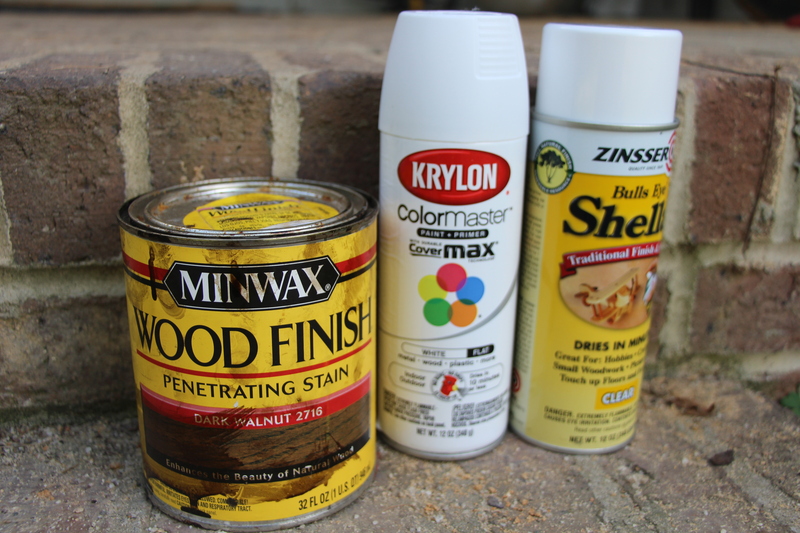 I have been slowly prepping for a few months now, shopping around at thrift stores and garage sales, thumbing through Pinterest, glittering, gluing, and spray painting. Needless to say I enjoyed the distraction. 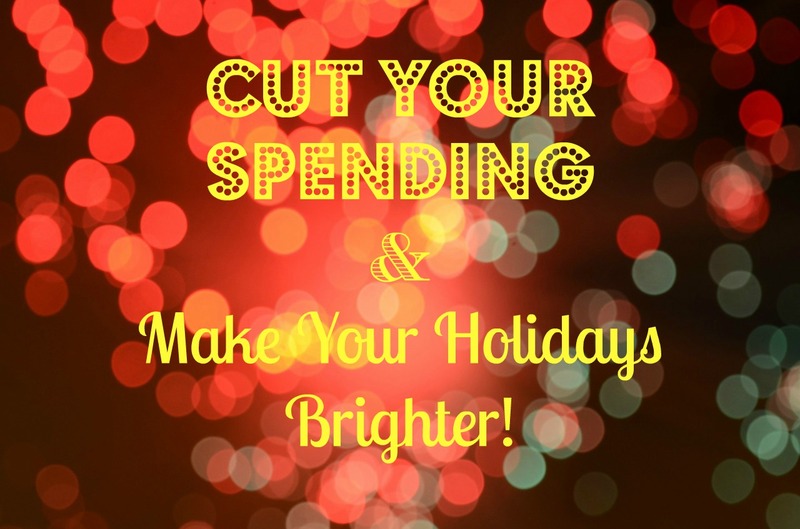 You know… from important things like laundry, vacuuming, and other house duties (gag). 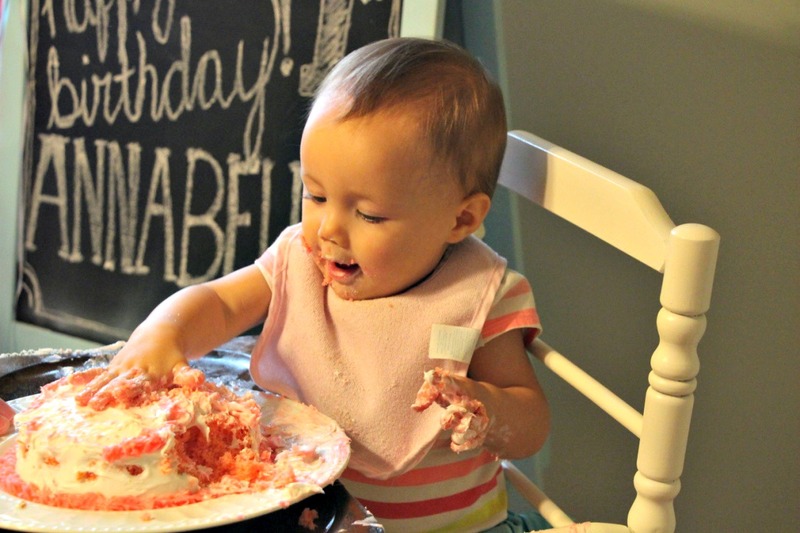 It was all worth it to gather good friends and family and watch my little one dig into her first cake. 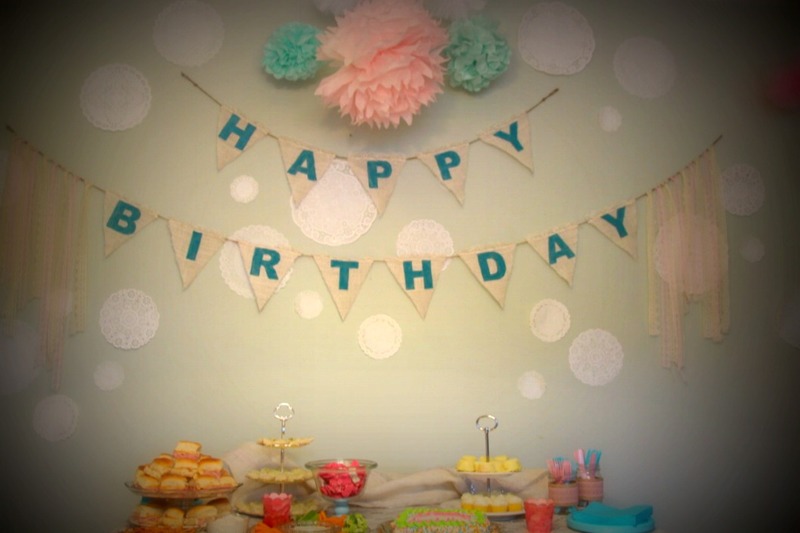 I thought in celebration I could give you a little peek inside the party and give you a few tips along the way! I can’t take all the credit for the planning of this party. A friend of mine has a daughter who’s birthday is the same week as Annabelle’s, so we decided to plan a joint party. 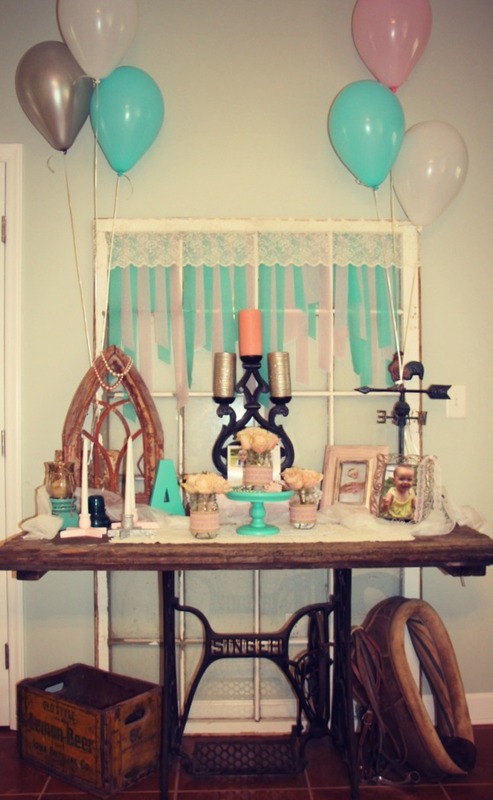 After much deliberation we chose to go with a vintage theme using lace, teals, silver, and pink. 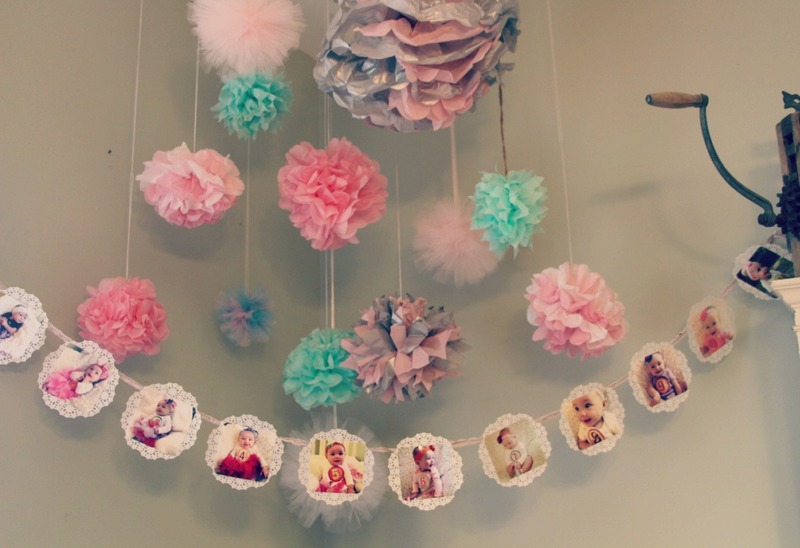 We wanted the party to be dainty, simple, and girly of course! Our goal was to make the party the perfect setup for pictures, especially since she won’t ever remember it! Tip: When choosing your party theme, you might consider something based on items you have already. Or find a piece that inspires you and work around that! I spend a lot of time at thrift stores. Like, at least once a week. Most of the time I’m just browsing for good deals and interesting pieces, but the party allowed me to actually focus! 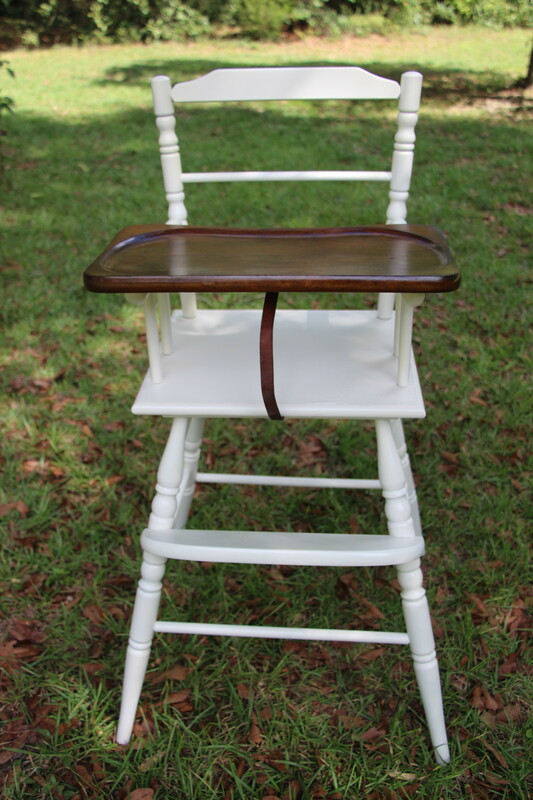 I looked for lace, cake stands, candle holders, and any pretty knick knacks that could be repainted or revamped. I didn’t spend a lot of time thinking about where everything would go or how I would use it. I knew that I would be inspired along the way (or the day before the party). The most I spent on one item was $10! Most of my items were under $4. Even though I spent months finding decorations, I saved a lot of money and I was able to enjoy myself in the process. My last stop for necessities was Hobby Lobby and Walmart for plates, streamers, cups, and balloons. 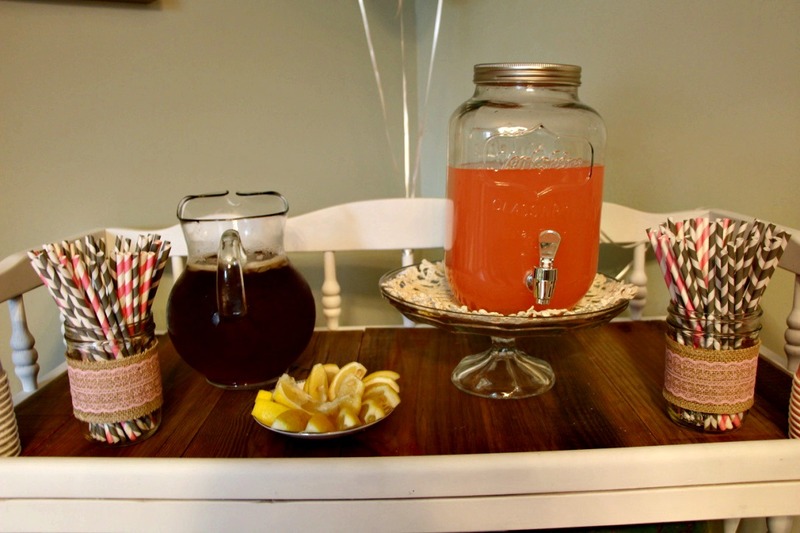 One of my favorite pieces we created with inspiration for the party, but also keep as a forever piece in our home was the beverage stand. It was a lot of fun to make. 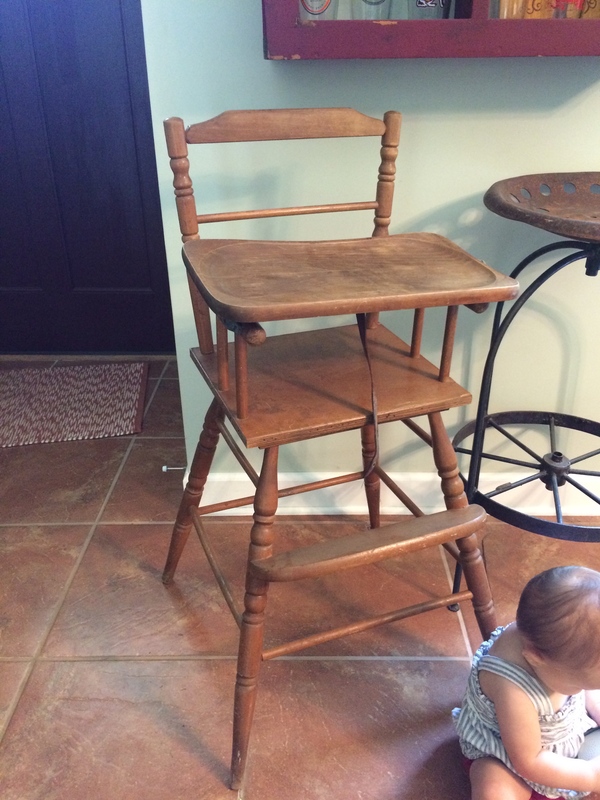 It all started on a weekly trip to Goodwill when I came across a nice wood changing table for $5. I couldn’t think of a use for it right then, but I just couldn’t pass up that good of a deal! 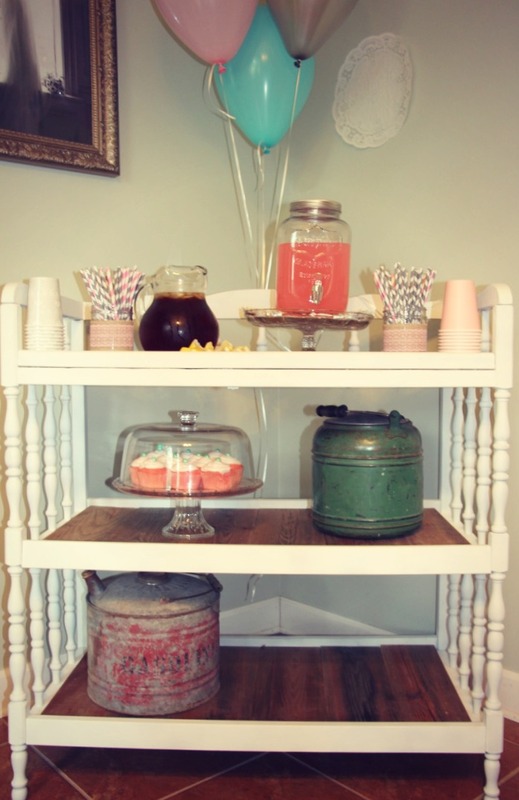 I took it home and searched “Repurposed Changing Table” on Pinterest and came across the beverage stand. I spray painted it white and had a friend with that has a saw mill cut wood slats to line the shelves with. I tried a new technique that a friend recommended in order to make the new wood look aged. I used a steel wool and vinegar mixture. I soaked fine grade steel wool in white vinegar for 2 days and then brushed the liquid over the lightly sanded wood pieces. Slowly (a day later), but surely the color started changing giving it the perfect aged look! I couldn’t be happier with how it turned out, thanks to friends and the hubby we were able to finish it before the party! Tip: When decorating, try to focus on one room or area. If you spread everything out it might look like you only have a few decorations here and there. If you put all in one room, it will look like you spent a lot more time and effort in your planning (even if you really only spent a week). Food was one thing I wanted to keep simple for the party. We scheduled it for after lunch time, so we provided light snacks and lots of sweets of course. We made ham and cheese sliders, cucumber squares, and fruit and veggie trays. For drinks I went with pink lemonade (because it’s girly) and sweet tea. All in all, I just wanted everyone (myself included) to have fun and enjoy each other’s company. 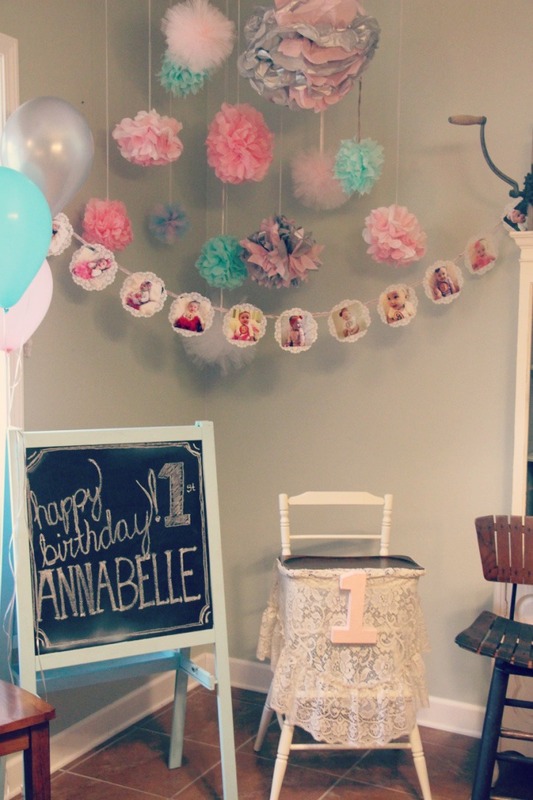 Planning a party for a one year old can be as easy or as hard as you want it to be. You can plan every little detail, but we all know things can change. Just keep in mind who the party is for. It shouldn’t be about the joy you get from successfully pulling off 3 month planned party. It should be about the joy in your baby’s eyes and the loved ones you are surrounded by. The rest is just a bonus. Thanks again for reading. See you next week! Let’s face it, your needs change depending on where you are, in life and geographically. I am becoming more familiar with my needs daily. 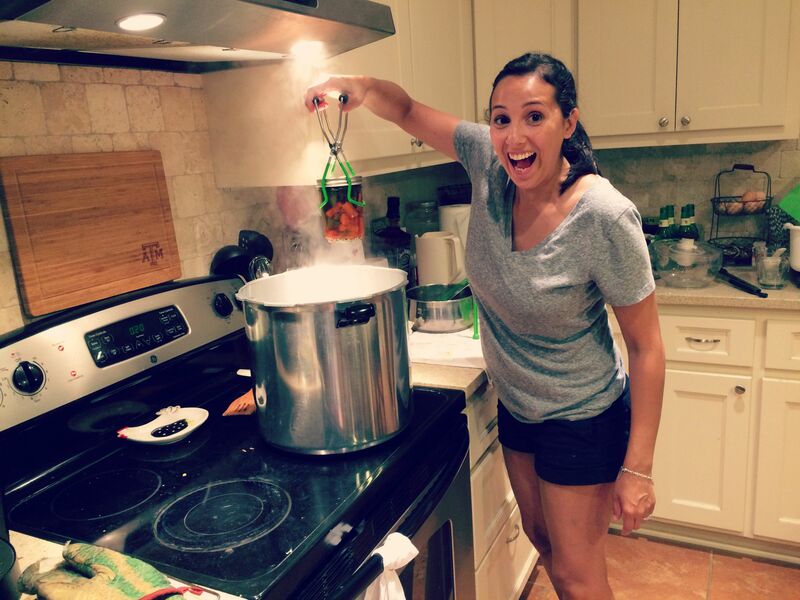 I went from independent city-wife to country living mama in a matter of 4 weeks! Yes, that’s accurate. It was quite the transition. Although there are many things that I used and needed in the city that are the same as those I need now, I need them for very different reasons. 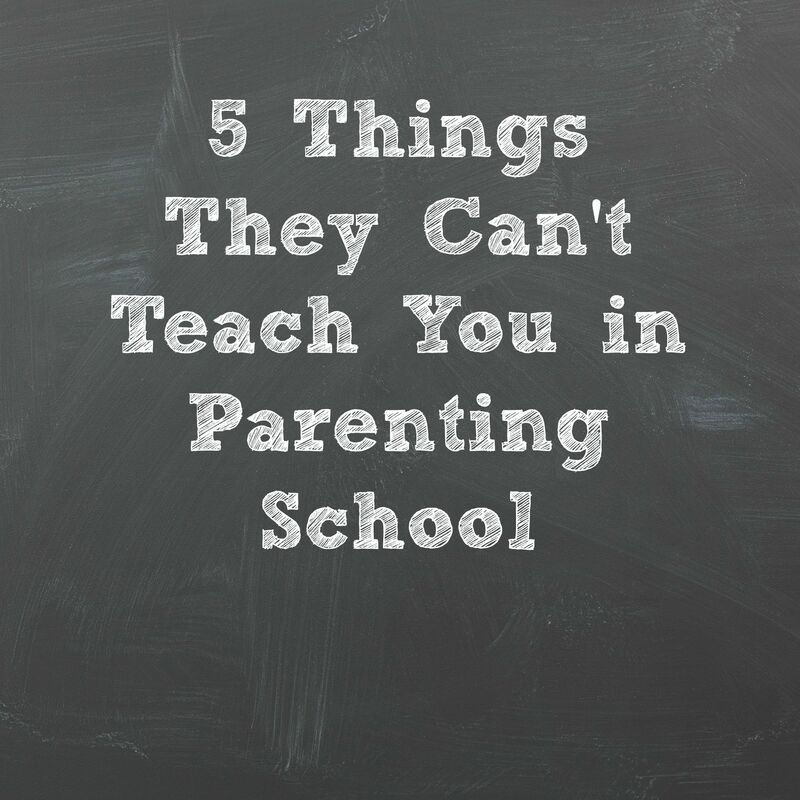 There are just some things that this mama cannot live without. Yes, for the purpose of this blog I definitely need the internet, but that’s not the reason it’s on my list! I have to admit that I feel the need to be connected with world with just the click of a button. FaceBook helps me feel closer to my friends and family that are so far away and it allows me to share all of the wonderful memories I am making with our first baby! Amazon Prime is another internet tool that has helped me tremendously. Being new parents and living 45 minutes away from most large retail stores made signing up for Prime an easy decision. I order diapers, supplements, dog food, tools, food, you name it. And I love that I can order last minute too! I mentioned in a previous post that we don’t have cable, but we DO have an antenna. It is capable of picking up channels within a 50 mile radius and according to our map we should be getting around 30 channels. The only downfall about being surrounded by trees is that your antenna reception isn’t always that great. But that’s ok! All I need is one news channel. Most days I can get one of the two to come in clearly, but some days I’m lucky and can get both! Regardless, I think its important to stay connected to the world. Even if it’s all about the crazy politics. This a new addition to the homestead, but its worth its weight in gold! After spending hours upon hours push mowing the 2 acres surrounding our house (a job mostly performed by my husband) we realized how precious our weekends were to us. We would much rather spend our time walking the trail, garage sailing, playing with the baby, or just relaxing. Now mowing the lawn is a task we almost fight over! Bug, bugs, EVERYWHERE! 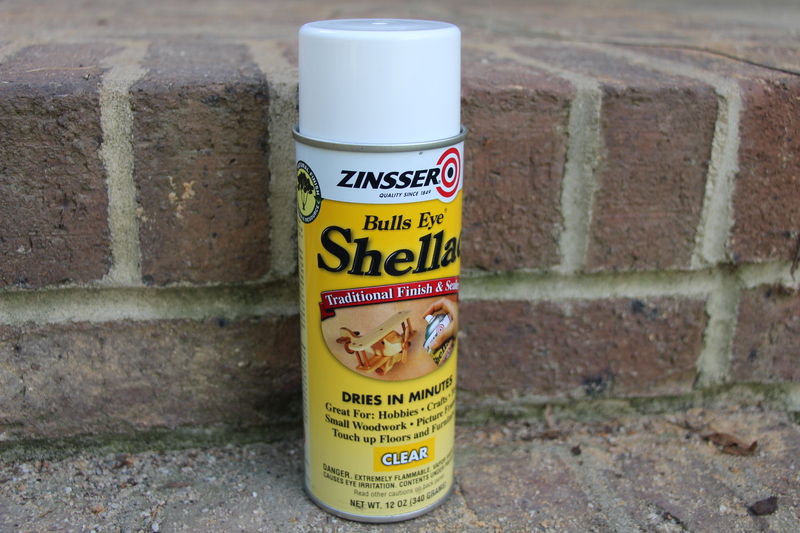 Summer time can be an absolute beating if you aren’t armed with a good bug repellent. We have experimented with several different remedies for the variety of bugs we have around here. Some critters in particular that drive me crazy are the chiggers! I hate those little boogers. We have found that using powdered sulfur around our ankles and pants helps tremendously. Just a little tip passed down from my Great Grandpa! This is one thing that I ABSOLUTELY could not live without. We have been so fortunate to have so many of our family and friends come out to visit. 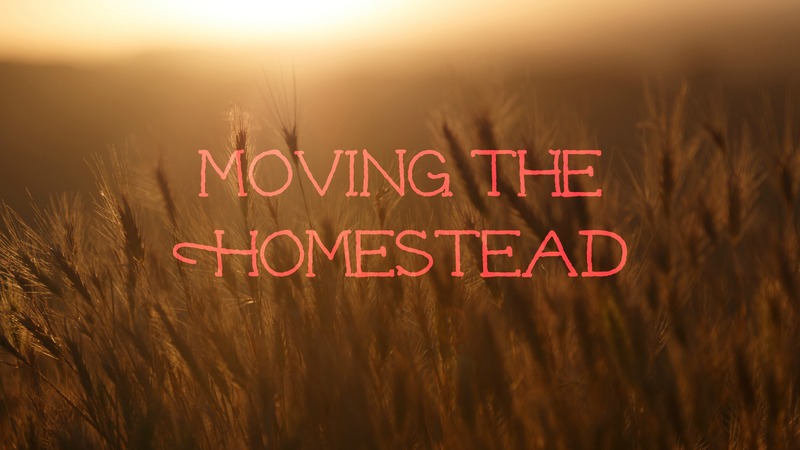 Being a stay at homesteader mom can get lonely at times. While I wouldn’t trade this experience for the world, I do wish I could share more of these moments with the people closest to me. Thankfully I get calls and texts daily from my loved ones. To be honest, we have had more months with visitors since we’ve lived here than we have had without! I went from shopping malls and trendy clothes to boots and bug spray. It has been quite a journey and a big adjustment, but well worth it! Thanks again for reading! 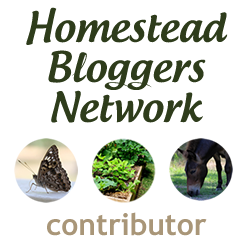 Don’t forget to subscribe and follow my blog! See you next week! Our most recent addition to the Harrod Homestead is our Barn Cat. We had been looking around for a free kitten for months, but had given up on the idea after many people requested it be an indoor cat. Being honest people, we just couldn’t do it! Well one lucky day we happened across a free stray kitten. While at the dump, out from under a large metal dumpster appears D.C. (aka Dumpster Cat). She was sweet and friendly from the moment we picked her up! We knew she would be the perfect addition to our growing homestead. WHY DID WE WANT A BARN CAT? Living out in the country, lots of livestock feed, and dark warm sheds are just a few of the factors that contribute to rodent problems around these parts. It is especially frustrating when the rats make it to your eggs before you do. Mice can also get into your feed which can leave dangerous bacteria that can make your animals sick. We don’t need that vet bill! Barn cats are great insect hunters as well. D.C. spends most of her day hunting grasshoppers, beetles, and other creepy crawlies. What’s great about that is she eats so many bugs during the day that she doesn’t need much food at night! If you are thinking about getting a barn cat and you have the time and patience to care for a kitten, it is best to start with a younger cat as opposed to a full grown cat. If you start with an older cat, they may be more inclined to run away and move on. We chose to go with a kitten for this reason. The important thing to consider when getting your barn cat as a kitten, is you will need to give it extra attention and provide a warm and safe place for it to live until it can fend for itself. Giving your kitten a lot of attention and human contact in the beginning is important so that it doesn’t become ferrel and afraid of humans (sometimes even mean). It is also suggested that you find a kitten that is used to being outdoors. They could be a stray like ours or kittens from another outdoor cat. 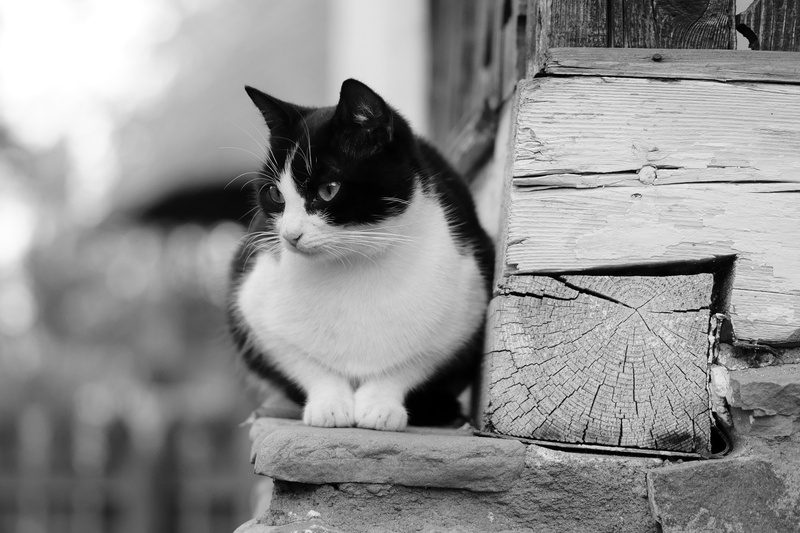 Cats that have been raised outdoors carry important instincts that you may not find in an indoor cat. We chose to keep our kitten locked in our shed inside of a large dog crate, with a fan and a light. We would let her out to run around and play during the day and keep her in at night and while we couldn’t supervise her. We slowly introduced her to the dogs and other animals on the property. Just a note… don’t hold the cat while you are introducing them. It can end badly for you (oops). If you have dogs that are difficult to control, this process might take a while longer for you. Luckily, our dogs are well trained and very tolerant. We also made it a point to bring the cat with us morning and night when we fed our animals out in the barn. We wanted her to feel comfortable with roaming around with them during the day. After all, thats where the rodents are! We also only feed her once a day. She eats plenty of bugs during the day that so we don’t worry about her being hungry. We keep her food and water in a covered area that only she can access, but we have also shown her where she can find the other animal’s water. Whether you are a cat lover or a dog lover (or maybe both), a barn cat can make a wonderful addition to your homestead. What’s one more to mouth feed? Thanks again everyone for reading, and I look forward to seeing you next week! 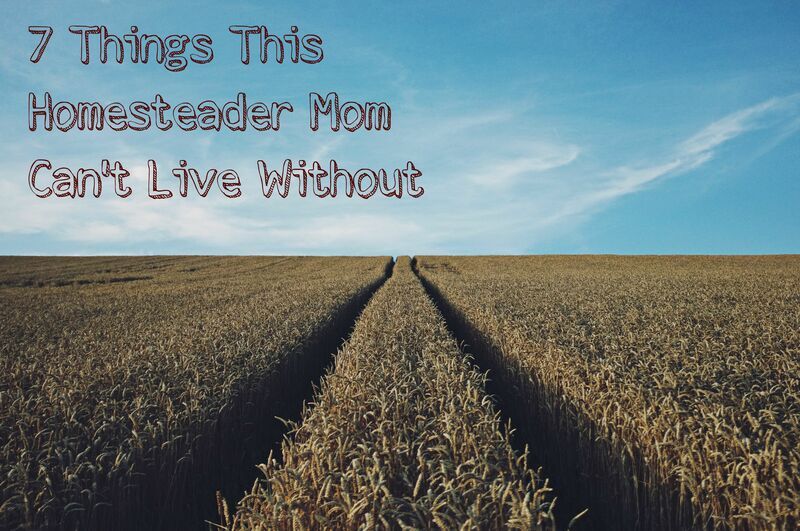 One of the biggest changes I have noticed after moving from city life to homesteading life is the attractions and activities we have to offer our friends and family that come to visit. Let me first mention that the main reason for everyone’s visits this year is to see my sweet baby girl, BUT the farm life is a bonus. In the city we worried about how to entertain. Where should we take them to eat? What big attractions should we visit? Should we go shopping or see a movie? Here it’s much easier. We come up with our own creative fun. After all, it literally takes less than 10 minutes to drive from one end of the town to the other. 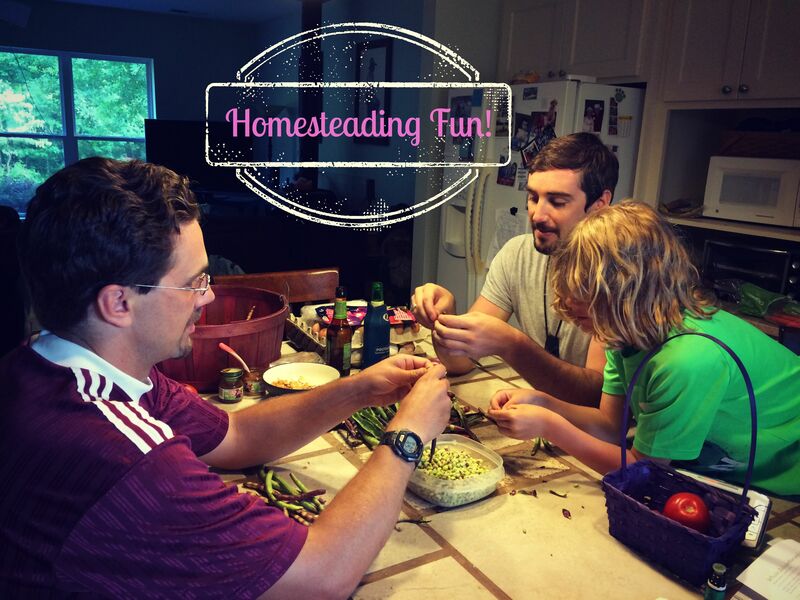 Here are some of the fun, simple activities we have for our guests here at the Harrod Homestead. The animals are the easiest form of entertainment here. We are already feeding them everyday so we might as well have a little fun with them! It can be as simple as collecting eggs and throwing scraps to the chickens and watching them chase each other around for one piece of crust. One of my favorite activities is taking the goats, dogs, cat (yes our cat), and baby for a long walk around the trail. There’s nothing cuter than seeing a parade of animals trot through the woods. Some of our visitors have never been around farm animals and some grew up with them, but its been years since they last stayed on a farm. One of the things I enjoy the most is hearing stories from years ago of how their parents raised animals and grew their own food. 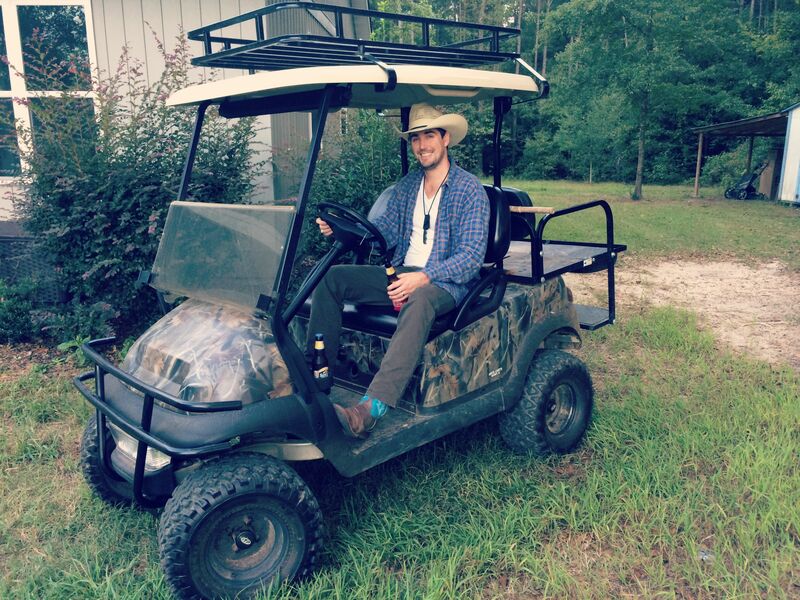 As soon as we found this property we invested in a golf cart so we could explore our property as often as we’d like, sweat and chigger free! We can take our guests through the woods, into the fields, and even for some off roading adventures. The kids enjoy driving the cart as well! We also recently purchased a riding lawnmower (a much needed investment). Not only is it a productive task, but for those that haven’t ever driven one, it can be an enjoyable activity as well! Although I am not a fan of any unwelcome critters creeping into my house, I love listening to them late at night while sitting on our porch or even spotting animals on our property. As soon as dusk hits in the spring and summer you can hear the thousands of frogs and toads start singing simultaneously. You can hear the coyotes calling to one another in the distance. And if you are really quiet while taking a night ride around the trail, you can hear the crunching of the leaves of some mysterious creature hiding behind the trees. No matter how many times I see a Little Blue Heron or a Black Racer snake, I am still fascinated by their existence. Being so close to nature all the time is one of the most beautiful things about living in the country. Our guests come to get away from all the hustle and bustle, but WE LIVE HERE. It still takes my breath away ever day. One thing I love about living out here is you find your creative side. You are forced to look at things differently. While you could hop in the car and drive 45 minutes to the nearest mall, you’d much rather stay here and enjoy God’s beautiful creation. Thanks again for reading! Come back again next week!